↑ "Dr Abdul Kalam, People's President in Sri Lanka". Daily News (Sri Lanka) via HighBeam Research. 23 January 2012. Retrieved 3 May 2012. ↑ Kalam, Avul Pakir Jainulabdeen Abdul; Tiwari, Arun (1 January 1999). Wings of Fire: An Autobiography. Universities Press. ISBN 978-81-7371-146-6. Retrieved 3 May 2012. ↑ Jai, Janak Raj (1 January 2003). Presidents of India, 1950–2003. Regency Publications. p. 296. ISBN 978-81-87498-65-0. Retrieved 22 April 2012. 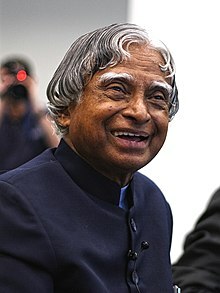 ↑ "Bio-data: Avul Pakir Jainulabdeen Abdul Kalam". Press Information Bureau, Government of India. 1 March 2012. Retrieved 1 March 2012. ↑ Sharma, Mahesh; Das, P.K. ; Bhalla, P. (2004). Pride of the Nation : Dr. A.P.J Abdul Kalam. Diamond Pocket Books (P) Ltd. p. 13. ISBN 978-81-288-0806-7. Retrieved 30 June 2012.